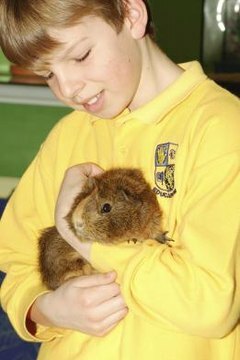 Guinea pigs are social animals who naturally enjoy interacting with one another but may be a bit more timid when they are around humans. When you bring your guinea pig home with you, expect to spend some time getting to know him. Do not be surprised when your new pet is a little bit skittish or hides from you, especially if he if he was not handled often or was handled badly. The more positive time you spend with your guinea pig, the more friendly he should be toward you. Talk to your guinea pig before you attempt to handle him. Sitting by his cage and talking to him will help him get used to the sound of your voice and your scent. Do not yell, scream or make sudden movements as all of these behaviors may frighten your pet. Offer your guinea pig a treat. Hold the treat in your hand and let him come to you to get it rather than you coming to him. Your guinea pig may take a few minutes to come to you but most guinea pigs eventually will be won over by the food. If your guinea pig is very skittish and is hiding, place the food outside his hiding place and wait for him to come out. You can talk to him while he eats his treats but do not attempt to pet him. Pet your guinea pig. Once your guinea pig is willing to come to you for food and doesn't respond to the sound of your voice by running for cover, you can start getting him used to being handled. Hold out your hand and let your guinea pig investigate you on his own terms. If he seems satisfied with your presence, you may give him a light pat on the back. If he enjoys the contact, keep petting him. If he runs away from the contact, give him a little while and try again. Keep trying until he accepts your touch willingly. Pick up your guinea pig by gently putting your hands under his middle section and lifting him up while supporting his rear. Hold him close to you so that he does not dangle or feel exposed to the elements. You may try wrapping your guinea pig in a towel or blanket to make him feel more comfortable. Hold your guinea pig gently and do not try to squish him. If he tries to get away, put him back in his cage. Practice holding him every day until he becomes socialized.  Once your guinea pig accepts being held and seems to enjoy socializing with you, try letting him out of his cage and playing with him.  Be careful not to drop your guinea pig or lose him when he is out of his cage. Serious injury or death may occur.